Alan Lomax playing guitar on stage at the Mountain Music Festival, Asheville, N.C.
John Lomax and his son, Alan, set out for one of the most ambitious tasks attempted in American folk song history: To travel thousands of miles and collect recordings of as many songs as possible in order to preserve them in the Library of Congress’s Archive of American Folk Song. Early in their travels, they came upon a black guitarist and singer named Huddie Ledbetter. He would later be more commonly known by his nickname, “Leadbelly.” The Lomaxes were very impressed with his repertoire of folk songs as well as his virtuosic skill as a twelve-string guitarist. As a result of his four year imprisonment in the Louisiana’s Angola Prison for murder, he was cut off from hearing the popular music of the day. For the Lomaxes, he was a prime living example of the folk tradition they were seeking out and sought to bring his voice to the American public. After employing him as a driver and servant, they brought him to New York in order to record and promote his “pure folk” sound. Leadbelly, three-quarter-length, profile, facing right, lifting car out of snow, at the home of Mary Elizabeth Barnicle, Wilton, Conn.
As you can see, the general notes and rhythms are still the same, with some added notes in Leadbelly’s performance. 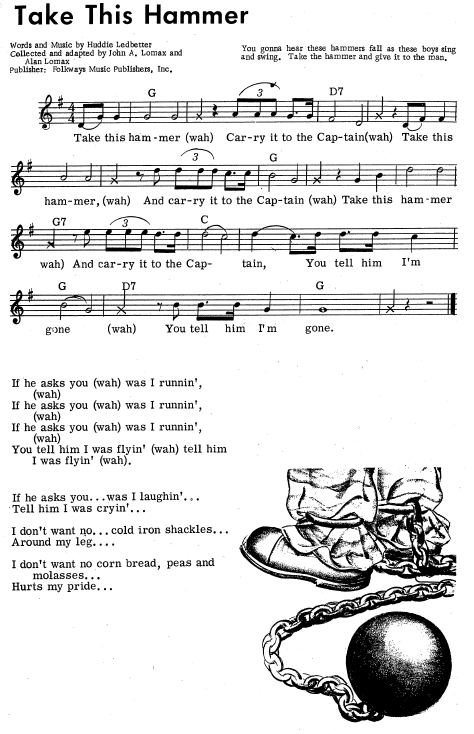 However, in the Leadbelly version, the controversial verses about the “captain” calling him a “nappy-headed devil” and grabbing his gun are omitted. 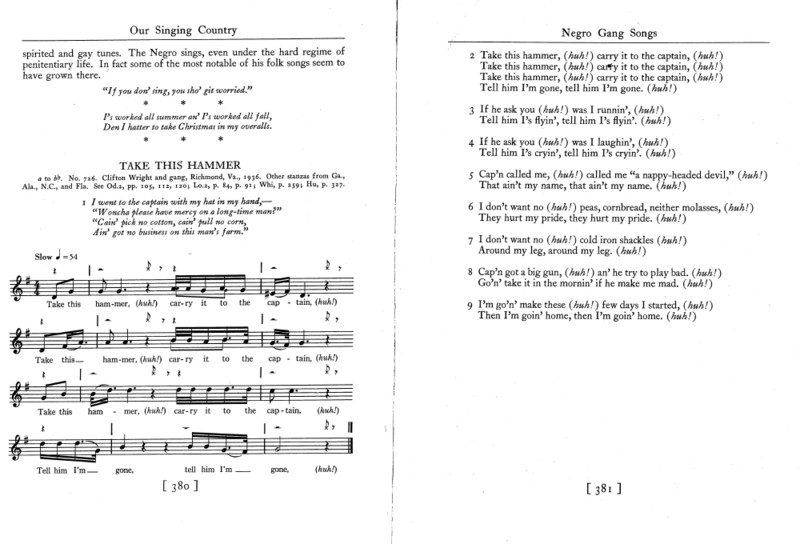 Also, in Our Singing Country, “Take This Hammer” is considered to be a highly rhythmic song that was sung when a slave worked in a gang in order to synchronize the dropping of axes and to “…make the work go more easily by adapting its rhythm to the rhythm of a song.” (citation) In the field recording, which lacks the dropping of picks but is conveyed through the “wahs” of the men singing, the tempo is considerably slower than when Leadbelly sings it. If the Lomaxes wanted to accurately portray the pure folk tradition in this song, they would have sent the Florida State prisoners to New York to record it how it would have been performed. But no one would have bought the record or even bothered to listen to it. Instead, they realized that in order for the dying folk tradition to be kept alive they had to bring the style into American popular music. Unlike the folk song preservers of the past, they respected the black musical tradition and wanted it to be accessible to white audiences without losing too much of its authenticity. In doing so, the Lomaxes brought folk music to the American popular music sphere and created a new musical tradition. 1. 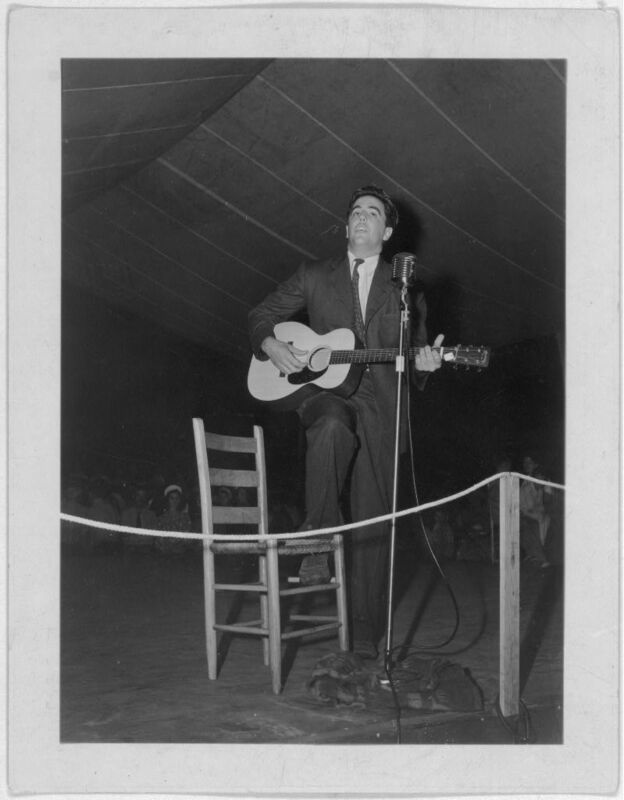 “Alan Lomax playing guitar on stage at the Mountain Music Festival, Asheville, N.C,” Library of Congress Prints and Photographs Division, Lomax Collection, http://www.loc.gov/pictures/collection/lomax/item/2007660160/ (accessed 3/2/15). 2. 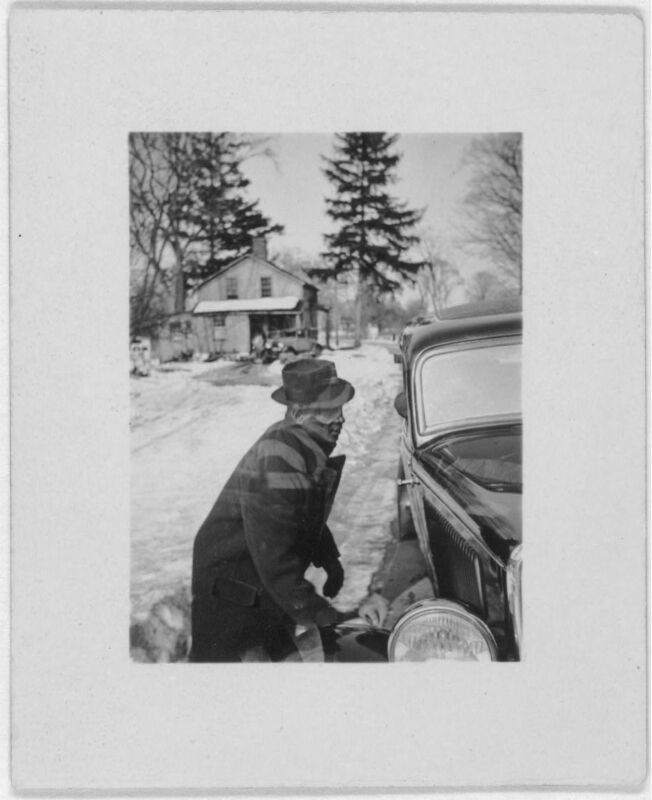 “Leadbelly, three-quarter-length, profile, facing right, lifting car out of snow, at the home of Mary Elizabeth Barnicle, Wilton, Conn,” Library of Congress Prints and Photographs Division, Lomax Collection, http://www.loc.gov/pictures/collection/lomax/item/2007660303/ (accessed 3/2/15). 3. John A. and Alan Lomax. Our Singing Country: Folk Songs and Ballads. (New York, Dover Publishing Inc., 2000), 380-381. 4. Moses Asch and Jerry Silverman, The Leadbelly Songbook. (London, Oak Publications, 1962), 45. This entry was posted in Donny Sison and tagged alan lomax, blues, folk, John Lomax, Lead Belly, Library of Congress, Our Singing Country by sison. Bookmark the permalink.